Mason jars are so versatile and convenient people often use them everyday, wether it be to hold your sweet tea, fresh picked flowers or your latest lighting bug catch! I just love them and think they are super cute! In this swap you will create ONE ATC for TWO partners. The ATC must have a mason jar included in the design. 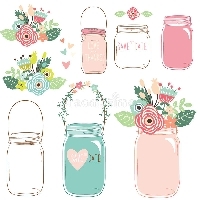 The mason jar can be an accent to your ATC or the whole ATC can be a mason jar. You have a mason jar somewhere on the card. Please make sure your completed ATC will fit inside the plastic sleeve of a card protector. Please create a good quality ATC that is made by you for this swap. Do not send someone elses work. Please include the swap name and your Swap-bot ID on your card. If you don’t know what an ATC is then I suggest you google it before you join. Thanks for checking out my swap! I hope you join in on the fun!! I won't join another swap by this host. She doesn't remove underage swappers or double profilers.